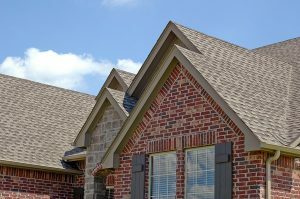 Although modern roofs are designed and built to withstand the local weather, every house is going to need a new roofing system installed at some point. The task can be intimidating as most people aren’t familiar with the available roofing options in today’s world, but understand the roof is going to be there for years to come. The solution is figuring out what works better according to budget, house design style, and personal preference. The modern paradigm of roofing suggests asphalt shingles, or more formally described as a fiberglass base covered with asphalt, as the typical roof on an American home. Asphalt shingles are relatively inexpensive yet offer the protection the house needs as your top barrier against the elements. The shingles come in a variety of colors to compliment any color palette used for the rest of the home’s exterior, and are available in the standard flat style most people are used to or with a variety of contours to provide depth and interest for the roof. Typically they have 25 or 30 year warranties, or there are lifetime and impact resistant versions for a house in an area with heavy weather or has the rigors of a wooded lot imposed on the roof. Rather than traditional asphalt shingles, some people may opt for a composite shingle design. Composite shingles are much more durable than traditional asphalt and offer eco-friendly benefits to a home. They add LEED points to a building to designate it as energy efficient by adding insulation to the roof which in turn can lower heating and cooling costs. They often fill the requirements for historic preservation, although they aren’t a historic material they can maintain the appearance required for a historic house. Metal roofing is yet another eco-friendly solution for a number of reasons. Modern metal roofing is made of insulated panels which helps lower electric bills over time. They’re often made of recycled materials, and are recyclable should they ever be removed. Metal roofs are essentially indestructible under normal circumstances. Your final decision depends on what suits your needs and will best serve your house. Any shingle style is going to be durable and serve its purpose, but each has advantages and disadvantages. The best idea is to discuss your budget and preferences with a reputable local contractor and listen to their advice as to what has worked best for other people in your situation. At Acme Roof Systems serving the DFW Metroplex, we’ll be happy to have a friendly and courteous representative come by at your convenience to discuss your needs and how we can best serve them.